Post Adoption: How Can I Teach My Child to be Gentle and Kind? This month my husband and I celebrate 19 years of marriage! I have been reflecting back on our life regarding all the wonderful things we have done. There are 2 that share the top spot: the birth of our twin boys, Colin and Sean and the adoption of our daughter LeAine. As a couple wanting to have a family, I cannot think of a better gift to a marriage than to share parenting of such amazing gifts from God. Upon looking around the room, I saw the same excitement, nervousness and anticipation in everyone’s eyes. Here we sat, halfway around the world, with regular couples like ourselves, anxiously waiting to meet and hold our daughters for the first time. Once we made it to the building, we were placed in a classroom-size room that was painted white and had white tile flooring. The walls were decorated with beautifully photographed Chinese children. There were five couches; each couple took up residency on their individual couch and sat talking quietly to their spouse. You could hear the soothing sounds of babies just beyond one of the four doors in our room. Each time resulting in an exchange of glances and giggles from around the room. Time seemed to have ticked by ever so slowly, but eventually our daughters came out one by one. Our daughter, Wu Chan Fung, came out first. We had carefully chosen the name LeAine Elizabeth and as she was placed in my arms I whispered her new name in her ear and told her how much I loved her. My husband was behind me with his arms around us as we soaked in the moment of holding our daughter for the first time. There was no doubt, we connected with our daughter instantly, and she was truly meant to be ours. This process repeated with the other four couples as they received their daughters. Each time, we shed tears for each other and our bond as a ‘family’ solidified. So, here we are, 7 years later and dedicated to keeping our families together. During this time we have traveled to St. Louis, Kansas City, Chicago and this year just outside Nashville in Tullahoma, TN. One family, temporarily living in Adu Dhabi, United Arab Emirates, even made the trip back to the States for our reunion. Though we stay in touch via email, occasional phone calls and social media, it doesn’t compare to the times we are all gathered together in person. To watch the girls interact with one another and to hear the laughter and constant chatter of their young voices is priceless. In addition, they share this time with their siblings; 5 brothers and 1 little sister. This year was slightly different for me personally, I observed the girls (they call each other ‘China Sisters’) more closely than before; I noticed the attention from bystanders and desires to have their curiosity about our girls answered. The questions asked were no different than what we have been asked since the beginning. What has changed is my sensitivity to the questions and the sudden awareness of the girls as we, their parents, answer the questions. I decided it was time to share a list of questions asked, innocently, but how the word choices can have negative impacts to any adopted child and their overall self-worth. Words are powerful and can create a perception that may not have been intended. Is she yours? (Looking confusingly between my black haired/brown-eyed daughter and me with light brown hair and blue eyes). My response: Yes, this is my daughter, don’t you see the similarities; she is tall like me and long hair. But she really takes after her daddy with their matching dimples. Why: At home, away from the inquiring questions of strangers, my daughter speaks of being the only one in our family without ‘blue eyes.’ I take time to share with her that we are all different, but have subtle similarities, like our long hair and dimples. Do you know her real parents? My response: Yes, I know her real parents very well. Follow up question: Really, what are they like? My response: I think they are great people! Follow up question: Wow, that is great, why did they give her up? My response: Oh, you were asking about her biological parents. I thought you were asking about her real parents, Brent and I. Why: Typically this question is asked while our daughter is in our presence. Rest assured, my husband and I ARE and WILL ALWAYS BE her REAL parents! We did not create her life, but we have her life and she gave us life! Where is she from? My response: She is from Harrisonville. Follow up question: I mean, where is she ‘from’? My response: She is from Harrisonville, where we live. If you are wanting to know where she was born, she was born in China. Why: It is important for any adoptive child to ensure they feel secure and that where they live is their home. How do your boys think about her? My response: They are typical brothers/sisters. Get along one moment, pick on each other the next; they are also one another’s biggest fans. My sons do not see her as anything else other than their sister, which is exactly what she is. 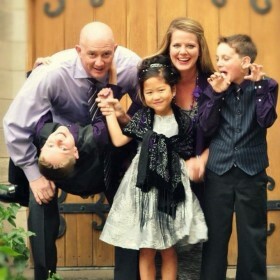 Why: We made it known before our adoption that we were not only increasing our family with another child, but our sons were getting a baby sister. The day we got off the plane and saw our sons at the end of the tarmac, they instantly bonded with their sister. It must feel awful to think someone could do that to her…give her up? My response: I truly do not know the details of my daughter’s beginning or even why her birth mother made this ultimate sacrifice. What I do know is that my daughter is one of my greatest treasures, as are my 2 sons. Why: Based on some of the facts of the day my daughter was found, I can only imagine it was one of the greatest selfless acts her birth mother could do, to know she could never give my daughter the life she deserved and made the ultimate choice to give her that chance. I do not paint a rosy picture for my daughter, I state reality. We do not know anything about her birth family, but we are forever grateful for giving us one of our most valuable treasures…her. Adoption is not for everyone, but for our family and the other four families that stood in that small white room seven years ago, we knew it was for us. We have dedicated our lives to raising our daughters, and all our children to the best of our abilities and to be well-rounded now and in the future. I pray for my daughter’s birth mother often, in hopes she has a sense of peace that LeAine is happy, healthy, and loved by her forever family; also, for my most sincere gratitude for my beautiful daughter. If you encounter a family that has grown through adoption, it is ok to ask questions, just take time in forming your words appropriately and ensure they do not hurt the child you are inquiring about. 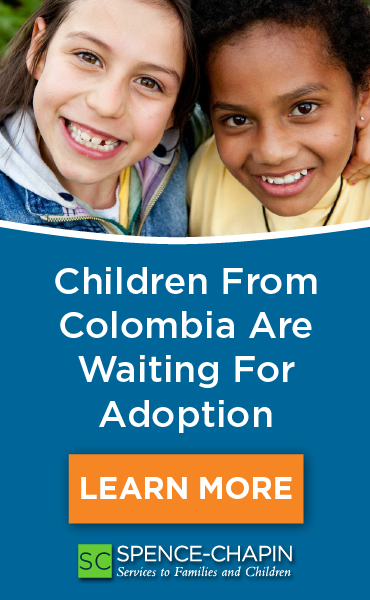 There are a lot of children looking for their forever families, foreign or domestic. Once they are connected, the children need the reinforcement they belong and are treated as a member of their family. If this resonated with you, or you know of others that could benefit from my words, please share!